This past Wednesday, I had the opportunity to go see Cory Doctorow (arguably my favorite author) on the local stop of his tour for his new book Homeland. He had been generous enough to give some local makergroups/hackerspaces a chance to say hello and drum up membership. I volunteered to talk about DorkbotPDX and found myself a spokesman. While we were waiting to get started, I got a chance to stand and talk to him for a few minutes before and after his talk. 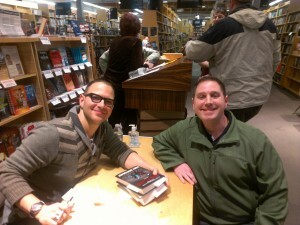 I’m a Cory Doctorow fan. Not a raving fanboi type fan, but I will say that there have been a few things I’ve been waiting for for a long time, and this evening (specifically this book) has been one of them. Cory is a certain kind of nerd-hero/celebrity. The kind where he’s famous in nerd circles and people would be excitedly star-struck, but outside those circles all you get is weird looks. This was punctuated by a situation that actually became an on-going joke between my wife and I. 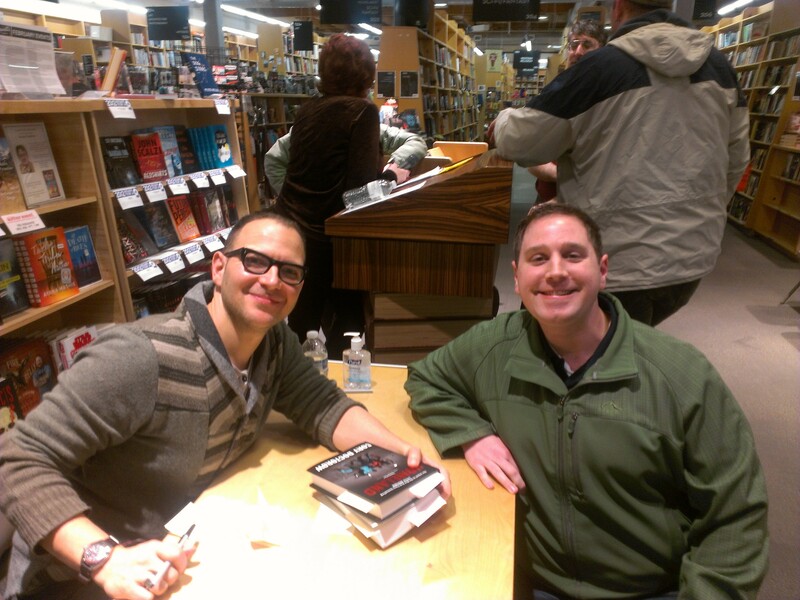 A number of years ago I was talking about something that Cory was involved in (rather excitedly), and she looked at me and said “Who?” It hadn’t occurred to me that she didn’t know who Cory Doctorow was. Since then, it’s always been our joke whenever I bring him up. So – Sometime between Cory coming out and getting started, he came over and introduced himself and thanked us (myself, and Dean Pierce – the current ‘head’ of BrainSilo) for coming. We had about 5 minutes before the official beginning of the event so we chatted… about nerd stuff. He pulled out his phone and I was curious what his preference of device was: “A Nexus 4”. 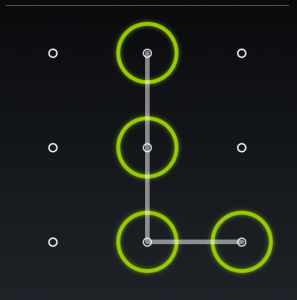 He went to show us it’s useful features and between unlockings I commented at the complexity of his lock pattern. He said “Well, you know what they say: ‘Go big or go home. '” It was something that I hadn’t really spent much time on. 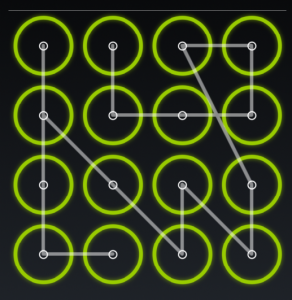 A few years ago I started using a pattern lock after getting concerned at the latitude that police have when not-arresting people. 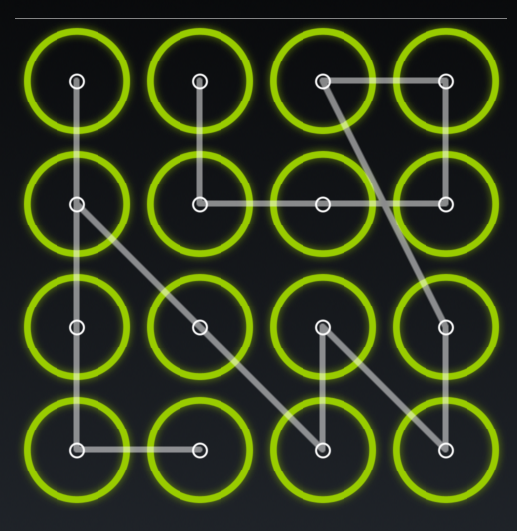 My pattern lock was simple because I wanted it to be easy to unlock. A truism of security is that you have to sacrifice convenience for it. How secure was my unlock really? And here was this person (whose views on security and privacy I respected) inadvertently teaching me the value of a strong password. Given a few days pondering over the matter, I switched from something that was like the left-hand picture to something more like the right-hand. After the event began, Cory gave us the option of him doing a reading or him giving a talk. The vote was unanimous in favor of a talk – Hykel mentioned that she’d wanted a reading, but hadn’t dared raise her hand without at least one other person. I suspect that more than one person felt the same way. Cory’s talk moved between a number of topics, but the one that seemed to stick with me most had to do with privacy. He talked a bit about abuses of privacy that come with power, and about how (as parents) we can’t teach our children that they need to value and protect their privacy from everyone except when it comes to us. He also spoke about Aaron Swartz and what his loss means to the world. After a half-dozen questions, we were orderly corralled into a line to get our “property defaced” (in his words). I got a picture with him and he thanked me again for sharing about Dorkbot. I had him sign a copy of Homeland for me, and a copy of Little Brother that I wanted to give to my sister’s family. In spite of being firmly placed in the “Young Adult” category, Little Brother has gained the award of “my favorite book”. I want other people to read it, and I wanted to give my sister and her family a copy so that they could read it. My sister’s family contains 2 kids, a 10-year-old and an 8-year-old. I mentioned this to Cory and he responded that they were probably a bit too young. I happen to agree with him, but it brought up a question I’d had in regard to it. I wanted to know when he felt his daughter would be old enough for his books. More specifically, I think I asked “When would you say to your daughter ‘here, go read this'”. He said he didn’t think he would ever give her his books, but that if she wanted to read them he hoped that she would at some point grab a book off the shelf and that he and his wife could help guide those decisions so that there was trust there. Sounds like a pretty dang good approach to me. Hykel and I spent the rest of the evening talking about the things that were discussed, and over the last few days we’ve had more discussions. She’s read Little Brother and I’ve finished Homeland. They’re both wonderful books that bring up a lot of valuable questions. 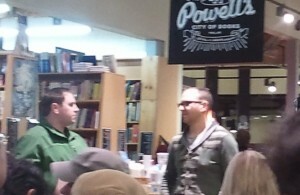 If you get a chance, go see Cory Doctorow talk. You may get a lesson about privacy, security, parenting, all kinds of stuff. His website can be found here. It was a fun event. You did a great job introducing DorkBot PDX, and I really enjoyed Cory’s presentation. I haven’t finished reading Homeland yet…I’m about 1/3 of the way in. But I just handed off Little Brother to my 16-yr-old niece for her to borrow. My oldest son has already read it and is looking forward to me finishing Homeland so he can read it. Security as it applies to parenting is a very sticky topic. Yes, on one hand we need to teach our kids to use strong passwords and never give the passwords out. Then things come up where the kids violate our trust and a parent needs to step in and “violate” their privacy. Or, for even very innocent reasons, such as the kid’s iPod breaks and the parent needs to replace it but needs to know the kid’s Apple ID password to do the backup/sync/restore stuff. Without getting into details…several months ago my daughter’s phone and iPod were confiscated by school police. She had done nothing wrong, but a friend of hers (who also did nothing wrong) was likely in some danger and there was evidence on these devices. In the interest of protecting her friend we willing gave them the devices. They cloned and downloaded what evidence they needed and returned the devices. (I then instructed her to change all her passwords of course.) As someone who is concerned about privacy and teaching my kids about privacy and also wanting to be a good parent, I was comfortable with the way I (and others) handled this situation. I wonder how Cory would have handled it. I suspect that in an ideal world the privacy/security relationship between parents and kids is a little like that of an employee and the IT department. There’s a trust there that needs to be maintained to make everyone’s life easier. There is of course, the large difference that you can’t fire your kids when they violate family policy. That sounds like a pretty terrifying situation about your daughter’s friend. The paranoid guy in me says that there is danger in providing non-warranted access to the police. I’m not sure how I would have handled that in the moment, especially if it was a time-sensitive situation. Pingback: Who? Cory Doctorow « Phloggings will continue until morale improves….